MAPLEWOOD, New Jersey — The hateful words drew gasps from the audience, pulling them back to 1960, hitting them head-on as the burly white U.S. Marshals escorted the tiny 6-year-old girl past angry white parents. There were haunting images of enraged white protesters, known euphemistically as the “cheerleaders,” stuffing a black-face doll into a crudely made cardboard casket, all captured forever on the grainy footage. The little girl in the freshly pressed dress paid no attention to any of it. She held her head high and walked purposefully through the schoolhouse door. 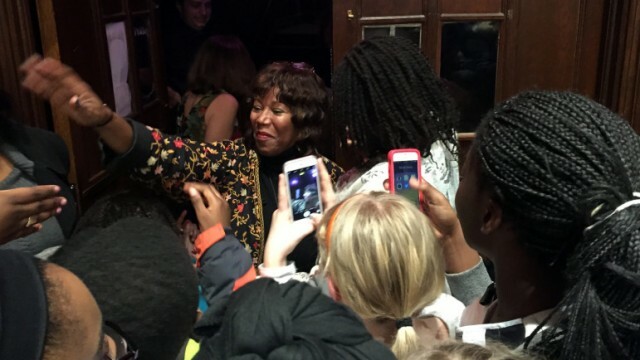 As the video’s last images faded, parents, teachers and children of all races and ages were left speechless as Ruby Bridges, now 61, stepped onto the Columbia High School stage. Just as it had been in 1960, her stride was deliberately slow, her head tilted with determination and a hint of humble defiance. “I just cannot believe this is all for me,” she said quietly. The crowd — which was standing room only — seemed to be pulled back to the now by the force of her presence. They rose to their feet with thunderous applause. Bridges was the guest of honor last Thursday for “An Evening with Ruby Bridges: A Single Act of Courage,” hosted by the South Orange-Maplewood School District Parenting Center and Elementary School PTAs.